Nicky Henderson's mood was tempered by concerns for the injury suffered by owner J P McManus' retained rider Barry Geraghty after Mark Walsh stepped in for a smooth three-length win in the extended three-mile G1 Doom Bar Sefton Novices' Hurdle on last month's Ballymore Novices' Hurdle second Champ (9/4 favourite), but there was no disguising his regard for the seven-year-old horse, who is named after Sir Anthony McCoy. He said: "Mark was in his suit walking off the racecourse when I called him back and told him to get changed, and although he knew absolutely nothing about Champ he did give him a beautiful ride. "Champ just needs too switch off and we very nearly switched him this morning to tomorrow's two-and-a half-mile novice with the change on the ground. I rang Barry three times, and J P and I talked for hours. It would have been perfectly legal, but Barry couldn't decide and I couldn't decide. The only thing I wanted to do was to find out if he did stay three miles for next year. "They didn't go a great gallop, but I thought it would tell us more for next season, when he'll have to go chasing. He's starting to live up to his name. He is good, and he just has the most lovely nature and temperament. I'm, not talking about McCoy, by the way. I'm talking about the horse. He's a lovely horse." Asked if he regrets not running Champ over three miles at Cheltenham he replied: "Not really, although I did run the wrong horse in the three-miler as Birchdale certainly should have been in the two-and-a-half miler. "Maybe I got Cheltenham all wrong. We do get it wrong quite a lot you know, but I got it right this morning." Mark Walsh picked up a winning spare ride on Champ in the G1 Doom Bar Sefton Novices' Hurdle following an injury to Barry Geraghty. 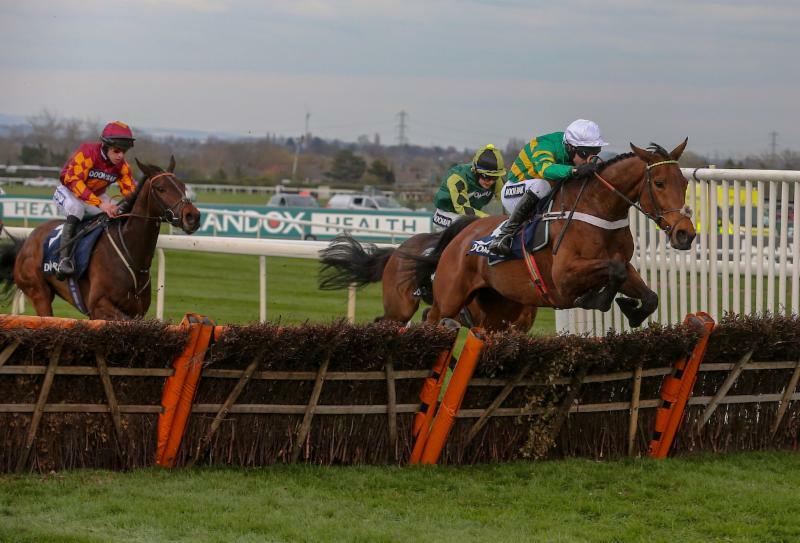 A fall in the Randox Health Topham Chase meant Geraghty was due to make a trip to hospital, and Walsh was in the right place to steer the Nicky Henderson-trained Champ to his fifth success of the season from six starts. His only defeat came in the G1 Ballymore Novices' Hurdle at Cheltenham where he finished second to the Martin Brassil-trained City Island, who was ridden by Walsh. The jockey now has a knowledge of two of the best staying novice hurdlers on either side of the Irish Sea. After Champ (9/4f) had beaten Emitom (5/1) and Lisnagar Oscar by 3l and 7l, Walsh said: "Hopefully Barry will be okay. Nicky said to me get him [Champ] settled and covered up, and everything went to plan. I was a little bit further back than I wanted, but he settled lovely - I gave him a little squeeze going down the back and he lit up with me a bit, but he was fine and I was able to keep my position. "He winged the third-last, landed in front and it was just a case of getting home. "I rode him to get the trip and drop the bridle. It was the one thing Nicky emphasised to me. He's a big horse, but very nimble on his feet and will make a lovely chaser one day. "When he goes over fences he will come into his own. They should suit him well. "That must make City Island very good - I hope so. It was a good race at Cheltenham and the form has been franked now. City Island is going to Punchestown next for a two-and-a-half mile Grade One race on the Friday [of that meeting]." Emitom, sent off a 5/1 chance, came home three-length second to the 9/4 favourite Champ in the £100,000 G1 Doom Bar Sefton Novices' Hurdle. Trained by Warren Greatrex in Lambourn, the five-year-old was having his first outing in G1 company and delighted his trainer with the run. Greatrex said: "He has run great. I just think the winner has had the first run on us. We tracked [Champ] all the way and were where we wanted to be and were probably just a couple of lengths behind. We have run all the way to the line. I am delighted. "He is a high-class horse and very exciting for next year. "We might have just pitched at the last, but I don't think he has lost a lot of momentum. "Emitom has done very well. It is good that he hasn't disappointed because you never know. This is his first run in a Grade 1. "We will regroup and go next year. He could turn into a stayers hurdle horse. He is going to do very well for us next year." Jockey Gavin Sheehan, added: "He jumped well and travelled well. We are stepping up into big boy company here. He has done it well for me. "I would say the Champ just got first run but we galloped all the way to the line. I am delighted."